Virtually every time President-elect Donald Trump performs in cities across America on his thank you tour, he mentions, to grand applause, his preference for Made in America. 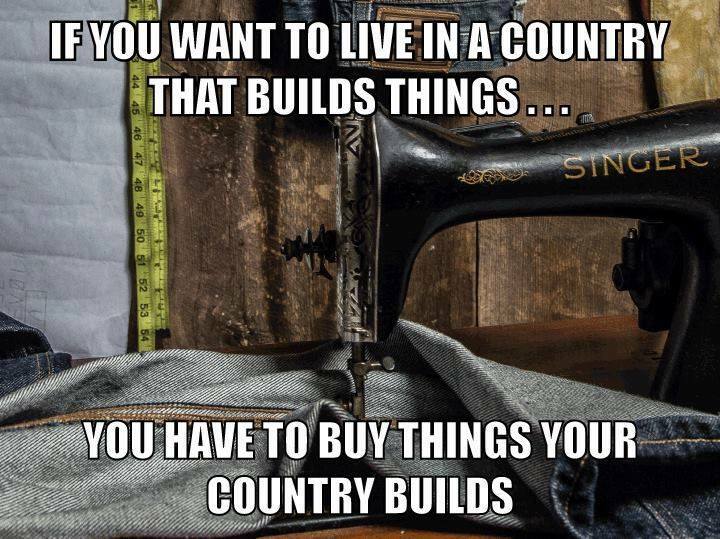 That American-job-creating, buy-American thing is supported by 71 percent of the American public. But it is a smack in the face to GOP Speaker of the House Paul Ryan, who just made it clear in the Water Resources Development Act that he’s fine with creating slave-wage iron-and-steel-making jobs in China with U.S. tax dollars so long as a few fat-cat iron-and-steel importers make a profit on the deal. So, clearly, there’s a battle brewing between the President-elect and the Speaker of the House. This is the President-elect who has repeatedly promised the working class men and women who elected him that he’d support Buy American provisions in federal law to create jobs for them. And it’s a GOP Speaker who wants to ship taxpayer-financed work overseas and let the working class wait a couple more decades to just possibly feel a tiny pinch of trickle down from the largess of filthy rich iron and steel importers. This, also, is a clash between a New York real estate titan who won the presidency and a Wisconsin lawmaker who lost the vice presidency. By advocating night after night for American Made, President-elect Trump essentially warned Ryan not to strip the Buy-American provisions out of the Water Resources Development Act. But Ryan did it anyway early in December when he got the act from the Senate. The act contained strong, permanent Buy America language when the Senate sent it over. These provisions are significant because they use tax dollars to create 33 percent more U.S. factory jobs, something that is, again, important to voters, 68 percent of whom told The Mellman Group & North Star Opinion Research in November in a national survey conducted for the Alliance for American Manufacturing that they were worried that the country had lost too many manufacturing jobs. In addition, and President-elect Trump knows this from the response he gets at his rallies, Buy American policies are very popular. Seventy-four percent of voters say large infrastructure projects financed by taxpayer money should be constructed with American-made materials and American workers. And those who voted for President-elect Trump agree more strongly – 79 percent of them say American-made should be given preference over the lowest bidder. This is a very big deal to iron and steel producers and workers in the United States. Far too many mills are closed or partially shuttered because of unfairly traded imports, and more than 16,000 steelworkers across this country have been laid off over the past year. China is the main culprit, but there are others. China produces so much steel now that it has managed to inundate the world with more steel than anyone needs. It is dumping steel on the world market at such low prices that no one can compete. As a result, producers from places as far flung as Mexico, the U.S., Canada, India, the U.K. and Spain are shutting down and throwing workers out of their jobs. China props up that excess steelmaking capacity with methods that are illegal under the terms of the agreements it entered into to gain access to the World Trade Organization and Permanent Normalized Trade Relations with the United States. If steel is sold domestically, a country can provide steel firms with subsidies like exemptions from utility payments and taxes, interest-free loans and free land. But those free market-warping subsidies violate international trade agreements when the steel is exported. That’s what China is doing. And it’s killing American steel companies and American jobs. When Ryan eliminated the permanent Buy American provision in the Water Bill, essentially saying it’s fine to import illegally subsidized Chinese iron and steel for taxpayer-financed water projects, he was also saying it is fine to bankrupt American steel companies and destroy American jobs. If the United States is reduced to buying steel from China to build its military tanks and armor, that’s okay with Ryan, as long as he maintains a great relationship with the lobbyists for the foreign steelmakers. They pushed him hard to drop the Buy American provision through Squire Patton Boggs, a Washington, D.C. lobby and law firm employing Ryan’s predecessor Speaker John Boehner and numerous former top GOP aides. He got hit with a Tweet storm after he chose Chinese jobs over American jobs, though. Buy American supporters and members of the Congressional Steel Caucus began pointing out on Twitter just how good #BuyAmerica is for American jobs and the economy and cited @realDonaldTrump, the President-elect’s Twitter handle on every Tweet, which means his account was alerted. And Steelworkers wrote protests on Ryan’s Facebook page and hundreds called Ryan and his anti-American-made Congressional crew. Ryan responded. Sort of. He restored one-year Buy American language to the bill. Nothing like the permanent provisions achieved in other federal laws, but it does keep the jobs for 12 months and the issue alive until President-elect Trump can take on Ryan mano-a-mano on Buy American after the inauguration. Ryan has made clear his anti-American preference, so this will be a royal rumble. But the Speaker should beware. The last time the President-elect stepped into the ring with a heavyweight, it was with the ring’s owner, World Wrestling Entertainment CEO Vince McMahon. And the former professional wrestler McMahon left bald and defeated.